GeoMax understand that you work in demanding environments and require excellent price-to-performance without compromising quality, that’s why we build products that “work when you do. From the day of beginning, we are betrothed in catering to the variegated demands of customers by bringing forth highly sophisticated Electronic Total Station. 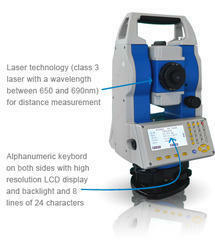 The HORIZON Series Total Station is a complete package solution. It covers the entire fi eld process in detail. The robust exterior shell of the HTS Series. Efficient, Fast, Reliable. The new GeoMax Zoom20 total station delivers exceptional performance and flexibility. The Zoom20 comes with a long life Li-Ion battery, robust reflectorless EDM measurements up to 400m and a wide variety of Apps for all your measuring tasks. Designed in Switzerland and manufactured in our facilities the GeoMax Zoom20 series “works when you do.